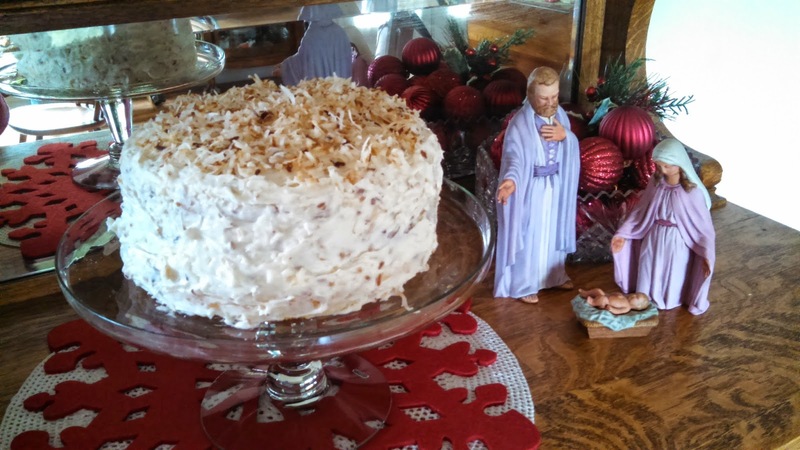 A special friend shared this recipe with me many years ago but it's still a favorite choice for any special occasion-- especially December birthdays! Blend cake mix, pudding mix,water, eggs and oil in large mixing bowl. Beat at medium speed for four minutes. Stir in coconut and nuts. Pour into 3 greased and floured cake pans. Bake at 350 degrees for about 20-25 minutes; cool in pans 15 minutes, then remove and cool on rack. Fill and top with Coconut Cream Cheese Frosting. Melt 2 tablespoons butter in skillet; add coconut, stirring constantly over low heat until golden brown. Spread coconut on absorbent paper to cool. Cream 2 tablespoons butter with cream cheese; add milk, beat in sugar gradually. Blend in vanilla.Stir in 1 3/4 cups of the coconut, and spread on tops of cake layers. Stack and sprinkle with remaining coconut. Optional: I spread icing between the layers, on top and the sides.